Breakfast on weekends tend to be a lazy and long affair. And sometimes can even be fairly elaborate. 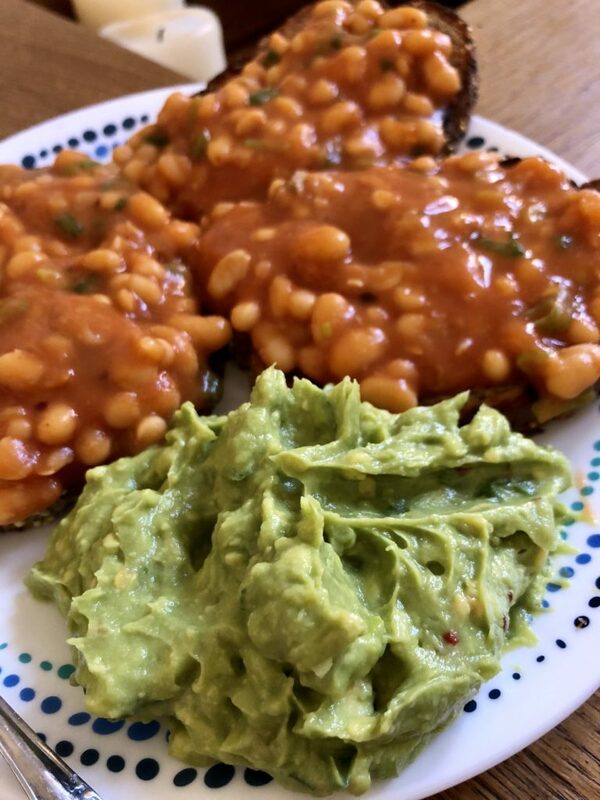 My Masala Baked Beans on Toast with Smashed Zingy Avocados is the perfect breakfast dish when you want a wholesome brekkie without cooking for ages in the kitchen. Although baked beans weren’t that easy to find growing up in Mumbai, they were a firm family favourite. Mum would always stock up on tins of baked beans when we’d come across them in one of those specialty stores. However, there were always pimped up so as to suit the Indian palate. 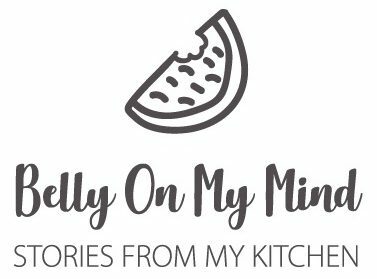 Tangy tomatoey sweet baked beans have always been a no no for me. Over the years, I have pimped up this rather simple breakfast dish and made it my own. This recipe is a great combination of simple store cupboard spices that will be sure to bring some warmth into good old baked beans. The first time I tasted an avocado was when I moved to the UK, and visited Chipotle. The mushy green unheard of ‘guacamole’ tasted rather delicous. Who knew back then, that my love affair with avocados was just about to start. 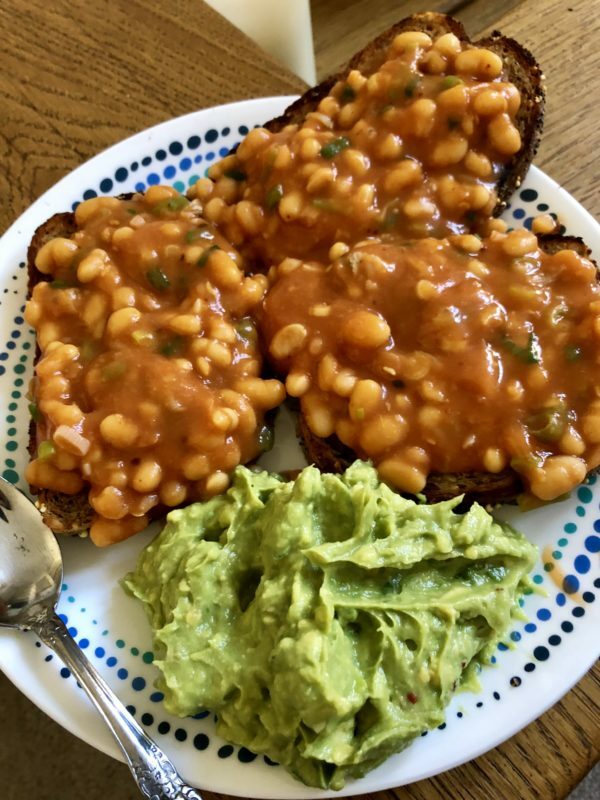 I serve up masala baked beans on toast but not without a generous dollop of smashed zingy avocados. Healthy and delicious and not time consuming at all, this breakfast plate will keep you full for a while and keep that smile on your face too. For the baked beans, heat olive oil in a saucepan. Once hot, add in the red chilli flakes and chopped garlic. Saute until the garlic is slightly brownish. Tip in the chopped spring onions and fry lightly. Now add in the baked beans, stir everything in and cook as per the instructions on the tin. Keep aside. For the smashed avocados, slice the avocados into half, and deseed. Now using a tablespoon, scoop out the avocado pulp into a bowl. Smash the avocado well, add in all the other ingredients - chopped spring onions, juice of lemon, red chilli flakes, salt and pepper. Mix everything together. Now sprinkle the chopped coriander in, and mix again. Serve the baked beans over toasted brown seeded bread and serve the smashed avocados as a side.